The open fields, widely spaced out hedges, water channels and soft, well-watered soils attract lots of wildfowl and waders to the Wexford Slobs. Far from being pristine wilderness, it is the Slobs’ use as farmland that has brought so many birds to feed, breed or winter here. Over 250 bird species have been recorded on the Reserve, many of them Winter migrants from Greenland and Arctic Canada or from Scandinavia and Arctic Russia. Others migrate more locally, breeding in other parts of Ireland and wintering on the Slobs. The site has special conservation interest for the following bird species: Little Grebe, Great Crested Grebe, Cormorant, Bewick’s Swan, Whooper Swan, Greenland White-fronted Goose, Light-bellied Brent Goose, Shelduck, Wigeon, Teal, Mallard, Pintail, Scaup, Goldeneye, Red-breasted Merganser, Hen Harrier, Coot, Oystercatcher, Golden Plover, Grey Plover, Lapwing, Knot, Sanderling, Dunlin, Black-tailed Godwit, Bar-tailed Godwit, Curlew, Redshank, Black-headed Gull, Lesser Black-backed Gull and Little Tern. Greenland White-fronted Geese are the most numerous and important goose species on the reserve. They were first recorded in the area around 1910 and numbers built up to several thousand in the 1940s. Numbers fell by the 1970s to around 5,000 birds but increased protection resulted in an increase up to 10,000. Since 1999 there has been a slight decrease, accompanied by smaller broods of young birds. The decline may be due to climate change in Greenland; displacement from nesting sites by Canada Geese and pressures on migration routes. Greenland White-fronted Geese have wintered in large numbers in Co. Wexford only since the 1940s. Also known as the Bog Goose, this species favours soft well-watered ground for feeding and as Irish bogs were increasingly drained and harvested in the early years of the 20th century, the geese had to look around for an alternative wintering ground. They found the Slobs and from the 1940s flocked here in increasing numbers until The Slobs became, along with Islay in Scotland, one of the White-front’s two wintering strongholds, each attracting thousands of geese. To learn more about the Greenland White-fronted Geese click here. 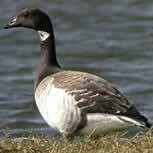 Over 2,000 Pale-bellied Brent Geese (picture), which breed in arctic Canada, also use the reserve in winter. Other goose species on the reserve include small numbers of European White-fronted Geese, Barnacle Geese, Pink-footed Geese and Snow Geese. Lesser White-fronted Geese, Red-breasted Geese and Greylag Geese also visit in small numbers. In the first half of the twentieth century Greylags were the main goose species in the area. Mute Swans – our largest native bird at up to 3,000 times the weight of the Goldcrest, our smallest – are present throughout the year especially in summer with a summer moulting flock of up to 240, look for them on the channels, especially from the Pat Walsh Hide. At this time, they moult their flight feathers and seek safety on the water, sometimes in large flocks, until the feathers regrow and the birds can fly again. Although not actually mute, this Swan does not call while flying, its wingbeats making a distinct sound instead. Up to 600 Whooper Swans from Iceland winter in the Reserve from October to March, feeding on the fields. This is the larger of our wintering swans, the size of a Mute Swan, with a straighter neck and a yellow rather than orange bill. 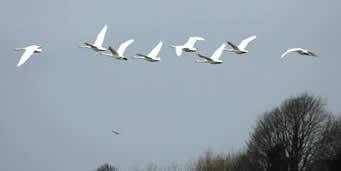 Unlike the Mute Swan, Whoopers call in flight. Smaller but otherwise similar Bewick’s Swans from Siberia and Arctic Russia also winter in the area with recent numbers of about 80, much reduced from previous decades. Most of them now stay further north as winters have become milder. The common wintering duck species are Mallard, Wigeon, Teal (picture, from Jobson Hide), Tufted Duck and Pochard with smaller numbers of Shelduck, Golden eye, Red-breasted Merganser, Shoveler, Gadwall, Scaup and Pintail. 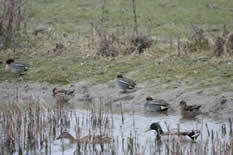 Rarer duck species visit occasionally and 31 species of duck have been recorded. In Wexford Harbour and Slobs as many as 42 wader species have been recorded including some North American vagrant species, vagrants are birds that have strayed out of their normal range, often after Atlantic storms. On the reserve itself the main species are Lapwing (picture), Golden Plover, Curlew, and Black-tailed Godwit, with smaller numbers of Redshank, Ruff, Oystercatcher, Dunlin, Spotted Redshank and Greenshank. Rarer waders occur in tiny numbers mainly on migration between April and June. From late June the first birds return from the north and their passage south continues until October. Great-crested Grebe, Little Grebe, Moorhen, Coot, Grey Heron and Little Egret all nest in or near the Reserve and can be seen through the summer. Locally nesting non-waterfowl species include Short-eared and Long-eared Owls, Cuckoo, Raven, Skylark, Meadow Pipit, Stonechat, Reed Bunting and Sedge Warbler. 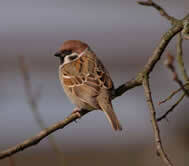 Rarer species breeding locally include the Reed Tree Sparrow Warbler and the Tree Sparrow (picture) for which many nest-boxes have been installed on the reserve and nearby. Five tern species can be seen from the shore in Summer, including Little, Common, Arctic, Sandwich and Roseate Terns, all of which breed in Co. Wexford. Large numbers of common farmland birds can be seen all-year round including Starlings, Rooks and Jackdaws alongside Common, Black-headed, Lesser Black-backed and Herring Gulls. Yellowhammers, now becoming scarce in Ireland, are present in winter. Birds of Prey in the area include locally-breeding Kestrels, Sparrowhawks and Peregrine Falcons; these are joined in winter by Hen Harriers, Merlins and Short-eared Owls. Hobbies, small falcons that hunt dragonflies, visit in summer but are not known to breed in Ireland. Occasionally, White-tailed Eagles from the re-established population in Killarney National Park have been observed to briefly visit. This is our largest bird of prey, it became extinct 100 years’ ago and its return is a major conservation project. The North Slob is a hare reserve, protecting a fluctuating population of Irish Hares (picture), which belong to a distinctive race of the European Mountain Hare. Unlike the Mountain Hares in other, more northerly countries, Irish Hares rarely turn white in winter, remaining a warm russet brown with white ear-fringes and pale eye-rings. The lack of long periods of standing snow in Ireland has removed the need for a white coat in winter. They differ from the more widespread Brown Hares of Britain and mainland Europe in having shorter ears and being a little smaller and more compact. 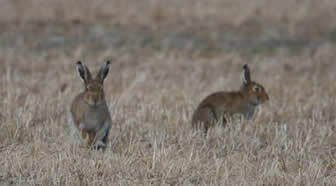 They are still larger and rangier than rabbits, if in doubt, check for black tips on the ears. Hares do not burrow but make nests or shelters called forms in the long grass. Rabbits live in burrows and those on the Slob make theirs in the raised ditches and on the former islands rather than in the wet, easily-waterlogged soils of the open fields. Red Foxes and Badgers are common in the area, with their earths (the dens of the Fox) and setts (those of the Badger) dug into the raised ditches and higher ground where the islands used to be. They share the Slob with two of Ireland’s other native carnivores; the Irish Stoat (a distinct subspecies that does not turn white in winter) and the Otter, as well introduced American Mink, an unwelcome invader, escaped from fur farms. The fields attract native Field Mice, one of our only two rodents native to Ireland, and introduced House Mice and Brown Rats, who in turn attract the attention of many birds of prey. The adjacent Raven Nature Reserve is a stronghold for Red Squirrels, our other native rodent, with around 200 living in the pine woods that are, so far, free of Grey Squirrel intrusion. These embattled squirrels are as shy as they are agile and are rarely seen but look for stripped and gnawed pine cones along the Raven walking trails, sure signs of the squirrels’ presence. A predator – and potential ally – of the Red Squirrel, the Pine Marten, another carnivore, is also known to live in the Raven. It is greatly feared by the larger, slower and introduced Grey Squirrel due to its agility in the trees and may improve the Red Squirrel’s prospects by possibly excluding Grey Squirrels from the Raven. Five bat species (out of 9 in the country) have been recorded locally: Common Pipistrelle, Soprano Pipistrelle, Daubenton’s or Water Bats, Long-eared and Leisler’s Bats. Our largest bat, the Leisler’s, is still only the size of a Swallow. These flying insect-hunters hibernate through the winter and forage through the rest of the year, eating about half their bodyweight in insects each night. Hundreds of seals are often to be seen on sandbanks at the mouth of Wexford Harbour and can be seen from the beach at the tip of the Raven, often resting alongside flocks of Cormorants. Most are Grey Seals but a few of the smaller Common (Harbour) Seals are often present. They head to offshore islands, such as the Saltees, to breed in November.